I thought I would share this recipe that we’ve used at holiday parties and at Christmas Eve and New Years Eve buffets. These are nice either served cold or warm and can be kept hot in a chafing dish. I prefer them cold. Put them on a nice platter that is lined with a colored foil and some sprigs of herbs such as thyme or rosemary for a nice presentation. They’re a little work, but well worth it. Puff pastry in different brands can be found in the frozen section of your supermarket. It usually comes four large rectangular sheets to the box. Defrost the puff pastry according to package directions. Saute the mushrooms and garlic in butter; add the parley and onion. Season the softened mushroom mixture with salt, thyme and pepper. Saute further until the liquid evaporates. Add the wine and cook the mixture until it becomes dry. Let cool. On a floured rolling surface, roll out 1 pastry sheet to 1/8 inch thickness. Cut out 24 circles with 2 inch round cookie cutter (if you do not have one, use a glass with a 2 inch rim dipped in flour). Place teaspoon of mushroom mixture on each piece of pastry dough leaving a 1/4 inch edge. Using a second piece of pastry, roll out and cut 24 more circular 2″ pieces. Use these for covering the first batch of filled rounds. Press down the edges and use a table fork to seal the edges. Put pastries on large ungreased baking sheets and brush with beaten egg, cream mixture. Cut a slit on top of each pastry to vent the steam. Repeat the process using the second package of pastry. Bake in a 375 degree Fahrenheit oven for 14 minutes or until mushroom appetizers are puffed up and golden. When lightly browned, remove to wire baking rack to cool. Serve warm or cold, but not do not refrigerate unless you are planning on serving them a few hours later. You may also freeze these in between sheets of waxed paper after they have cooled and reheat in a conventional oven. They do not microwave well. I hope these are a big hit at your next holiday gathering. Whenever it is time for a holiday gathering, especially for those open house parties that are held at the end of the year, we like to serve up a variety of salads. One of our favorites is this Italian style antipasto salads of which you can mix and match the vegetables and meats to suit your own tastes. This one features traditional Italian cold cuts that can be obtained at your supermarket deli counter or in Italian food specialty shops. Sometimes, I switch the ingredients around, using julienned turkey or reduced salt ham and cheeses for the saltier Italian cold cuts and replace the plain iceberg lettuce base with varied leafy greens to line the platter as a base. It’s you choice whether to make the traditional Italian style salad or whether you would rather have the reduced-salt, lower calorie version. As long as the vegetables are the marinated version, the taste should remain close to the original. I often use leafy greens like iceberg, romaine, red leaf and Bibb lettuce as well as the mixed greens like Mesclun, spinach and Italian blend that come in large bags at warehouse stores. Line a large platter with layers of lettuce or greens making salad as large as you like. Place in order on top of greens – peppers, artichokes, olives, mushrooms, onion, peppers, and anchovies. Decoratively top with sliced cold cuts. I use a homemade Italian dressing to top this, but some like just a bit of olive oil and vinegar with the addition of a bit of oregano. 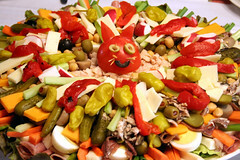 You may use any dressing that suits you or serve with a variety of dressings presented with holiday spoons and bowls. I hope your holiday parties are fun and festive. Happy Holidays from my house to yours!!! Cream butter and sugar until blended and light. Add the egg and molasses. Mix well. Dissolve the baking soda in the boiling water. Sift the flour with the salt and ginger powder and add the hot water to the first mixture and then stir this into the dry ingredients. Chill this for at least one hour. Roll the dough very thin and cut with a cookie cutter of your choosing which has been dipped in flour. Bake in 375 degree Fahrenheit oven for approximately 15 minutes being careful to watch closely as these can burn quickly. Cookies should be firm but not overly browned. 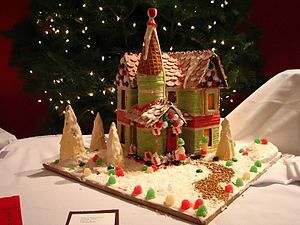 Cookies can be used as walls and roof for a gingerbread house with either a pre-bought kit or cut freehand from your own pattern. Serving amount dependent on size of your cookie cutters. I use a 2 inch cutter. You can also make ornament shaped ones using a 2 inch glass rim dipped in flour and then decorated with sugar frosting and sprinkles. “The snow had begun n the gloaming. Here is a good little recipes that will leave your guests raving. It tastes great and can be kept warm either in a chafing dish or just use your crockpot to keep it warm. These come out best when done on the stove top and really aren’t too difficult. We’ve used them a lot for Christmas Eve buffets and they go over just as big on New Years Eve. These can be made ahead and refrigerated of frozen with the meatballs held in one container and the sauce in a different one. Thaw sauce and meatballs and put the dish together at the last-minute. Mix the ground beef, cracker crumbs, evaporated milk, onion and salt together until thoroughly blended. 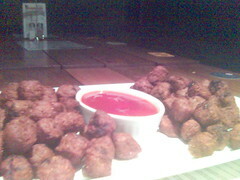 Shape mixture into tiny meatballs. Brown in frying pan in canola oil. Remove from heat. Drain oil from skillet reserving about 2 tablespoons of the oil. Add bouillon, green peppers and pineapple. Cover and cook over medium heat for approximately 10 minutes until softened. In the meantime, mix cornstarch, soy sauce, seasoned salt (accent) vinegar, pineapple juice, sugar, salt and pepper. Add the mixture to the pineapple, bouillon, and green peppers in skillet and simmer, stirring constantly until mixture thickens. Return meatball to sauce. Serve in chafing dish or keep warm in crockpot. Use cocktail picks to serve. These go good with cocktail bread or tiny croissants. May your holiday season be a joyous one. 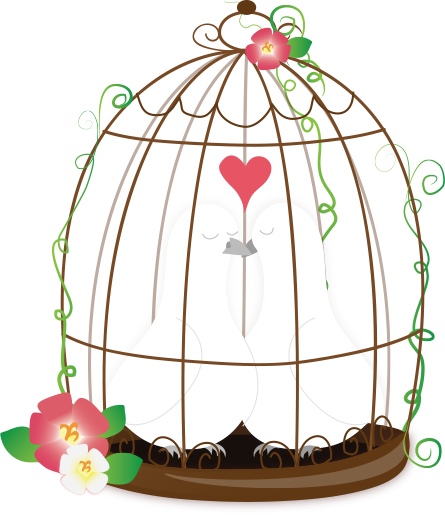 I hope you like these as much as we do. For a different punch while you, your family and friends put up the Christmas decorations, I’ve opted for a cold punch instead of a hot one. This punch serves 40 punch cup servings (or less in 6-8 ounce glass). Even though the punch can be used for the summer, it has a heavy-bodied feel that is nice in the winter, too. Combine the sugar, coffee and vanilla. Stir to dissolve. Refrigerate mixture. 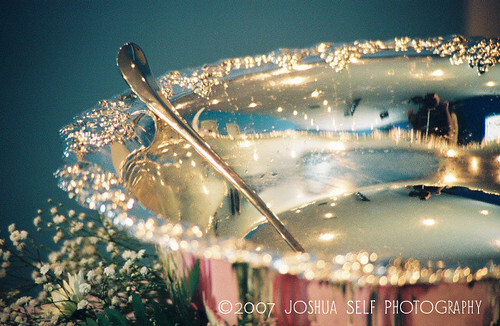 To serve, scoop ice cream into the punch bowl. Add refrigerated coffee mixture and then gently fold in the whipped cream. Sprinkle the top with grated nutmeg to taste. I serve this up in an antique milk glass bowl, but it also looks great in a cranberry glass bowl and ladled up with a silver ladle. Some appetizer recipes are to follow. Happy decorating. It’s time to bring tree, ornaments, and lights from the storage room!!! I’ve decided to broach the subject of the dreaded Christmas fruitcake which I know is not all as popular as it was years ago. I’ll start by giving a brief history of the lowly fruitcake’s origins. Fruit cake originated, it is believed, in ancient Rome in a much simpler form. 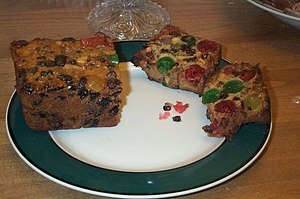 It started to be called ‘fruitcake’ in the Middle Ages when spice, honey and preserved fruits were added to it. With the discovery of America and the sugars that were produced in the colonies and the abundance of fruits and nuts, the fruitcake began to come into it’s own. It was now possible to obtain inexpensive sweeteners and many different types of ingredients to add to the cakes. In the 1700’s nuts were often added to the fruitcake to celebrate good fortune and the abundant harvests. 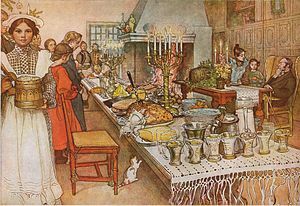 A great many different types of fruitcakes were produced, varying from light to dark, according to what type of fruits, flours, and nuts were used. Traditional fruitcake are soaked in liquor to flavor and preserve the cakes, with brandy and rum being most often used for soaking. Many fruitcake recipes have been handed down through generations of a family. Measure out ingredients in advance for easier preparation. Thoroughly grease two 8″ x 5″ x 3″ loaf pans. Dredge the fruit and nuts with flour and set aside. Cream the butter and sugar. Add the eggs, one at a time, beating well after each. Sift the remaining flour with spices, baking soda and salt. Add to the creamed butter and sugar mixture alternating with adding the liquor, spices, and vanilla. Fold the floured fruit and nuts into the batter. Pour into prepared loaf pans – put the loaf pans into a large pan of hot water and bake for about 2-2 1/2 hours or until knife inserted in center comes out clean. Cool ten minutes and gently remove cakes to a wire baking rack to further cool. When cool, fruitcake can be further soaked in brandy or rum by drizzling liquor onto cake and letting it seep in to moisten. Wrap cakes thoroughly in plastic wrap. They can be aged for several weeks for flavors to meld. Good served with cream cheese or butter. HAPPY BAKING AND HAPPY HOLIDAY SEASON.